Bruce Springsteen. In Boston Garden. On my birthday. Can it possibly get any better? Yes it can, and yes it did! I love the new TD Bank North Garden (formerly the Fleet Center, formerly the “Why couldn’t they just call it Boston Garden?”). I see all the banners for the World Champion Celtics and I look at how they dominated the 1960s and then look at the last time they won and think, guys, what the hell happened? And to see those legendary Bruins names: Bobby Orr, Ray Bourke, and all the others — is amazing. Most of those legends never played their careers in THIS building, but there still is a sense of wonder for the sports history they made in the original Boston Garden. At 8:30 sharp (um, ticket said 7:30, Boss) the lights went down, the crowd started screaming and … um, carnival music began to play as an object rose out of the floor and you think, “What the hell is that thing?” It’s a restored calliope that Springsteen had just been given as a gift. You might not know (or not have access to Wikipedia) that a calliope, also called a steam piano, is a musical instrument that produces sound by sending steam through whistles, It was often played on riverboats and in circuses, and is used as the characteristic instrument of Merry-go-Rounds. And what does this have to do with this tour? Nothing, as far as I can tell. So I guess this where we say, “Um, nice calliope, Bruce,” and move on. That bizarreness aside, suddenly Springsteen screams “Is there anybody alive out there” twice and rips into a version of Radio Nowhere that is absolutely SCORCHING. 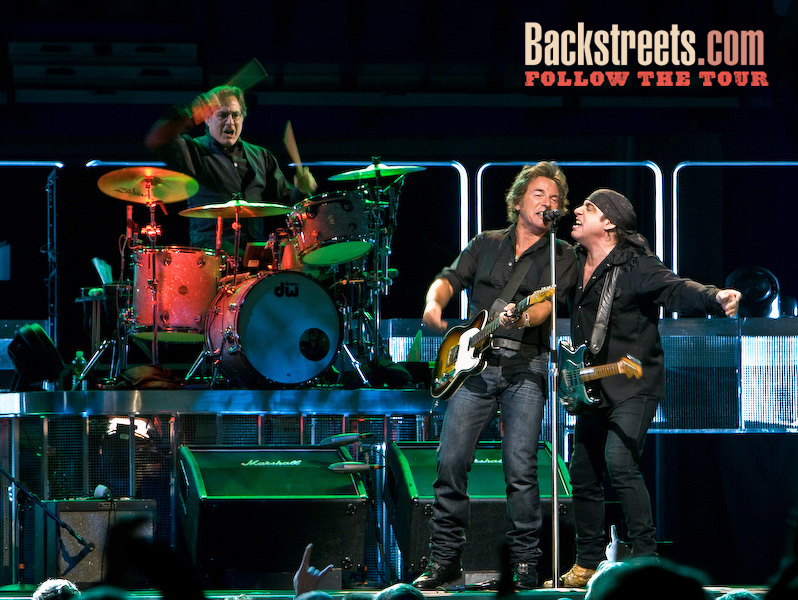 The show is off to a hard rock, full throttle start and the E Street Band sounds tight. Familiar, yes, but new. The band is (to use the cliché) such a well oiled machine, so in sync with each other that the sound is just, well, tight. Perfect. Springsteen’s conversation and banter were at a minimum this evening; Springsteen and the band were obviously having a great time and clearly intent on playing a non-stop, won’t catch your breath show — and for the most part it worked very well. Springsteen doesn’t run around the stage as much as he used to (understandably) but still burns the guitar and learned how to make it talk. Whether he was on guitar, harmonica, or piano — he continued to prove his mastery of music. 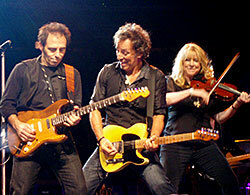 Radio nowhere ended and the band broke into an incredible surprise, the Born to Run classic, Night. I literally screamed with joy. The Born to Run album is arguably Springsteen’s greatest, and many of the cuts from it aren’t played often enough (although Springsteen did play Jungleland at the first Boston show the night before). NO ONE but Clarence can play sax on this one! In-credible. Springsteen played the song on the Today Show and a few other stops, but it caught the crowd completely off guard. Night is quintessential Springsteen, quintessential E Street, classic Springsteen and there just isn’t a superlative worthy of describing tonight’s rendition. 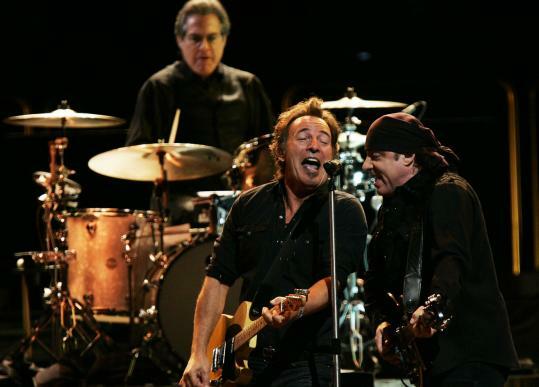 It was that good — and obvious that this was a show for the fans — with many tracks seemingly chosen to play for the long time “tramps” who have followed The Boss since the early days. Lonesome Day was next; it’s another powerhouse and Soozie’s violin has always made this song even better. It was here I noticed how GOOD Springsteen’s voice sounded tonight. Gypsy Biker is a moving song, one of my very favorites from the new album and I was thinking to myself how INCREDIBLE the guitar playing (by both Steve and Springsteen) was here, and how much the band seemed into the night. I liked that Steve was so prominent this evening, helping out on many songs. And God, I love it when Springsteen plays the harmonica. Magic “This is the title track from the new CD,” Springsteen said, with such an emphasis on “CD” that I thought he was going to correct himself and say, “Album,” as he always does. But he didn’t. In one of the two times he got political this evening, Springsteen said, “It’s about living through a time when the truth gets twisted to sound like a lie and lies get twisted to sound like the truth. This is a time of betrayal and deceit, and the wheel on the street spins … It’s called ‘Magic’ but it’s really about tricks.” Musically the song was presented almost acoustic, just Bruce and Patti, very pretty, very haunting. I like it when the Springsteens sing together, they didn’t do much of that this evening. 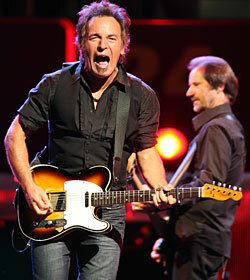 Reason to Believe: “Shhhhhhhhhhhhhh” Springsteen told us several times. Gotta admit, this Nebraska song has NEVER been a favorite. It’s got a new jazzy-blues mix, a lot more harmonica but I just have never liked this one. Didn’t help that for part of it Springsteen used the god-awful “audible” microphone (makes a voice sound like you’re singing through cement). … But that’s okay because the next triple-play blew my socks off. Darkness on the Edge of Town: I got Goosebumps (literally) when Springsteen broke into Darkness. This is one of those Springsteen songs that you know every word, you sing very word and just feel the emotion every single time you hear it. Darkness is a beyond a classic — but live it’s just in-credible. It’s a track that can be played many ways, but despite the brooding in its lyrics I’ve always heard hope, and that’s how Springsteen played it tonight. She’s the One: Another BTR track that doesn’t get enough play anymore, She’s the one is another song that gives you chills and Roy’s keyboards and Clarence’s sax made this one perfect. Just about brought down the house. the team he loves, from “New … New … New … Haven Connecticut!! !” Then he got serious as he introduced Living in the future He talked about how the country has been sleepwalking through things like rendition and wire-tapping — an attack on the constitution. “We’re going to sing about it! It’s a start! The rest is up to you … to us.” This song is absolutely effervescent on the surface and then you hear the lyrics. Like many of the songs off Magic, the crowd didn’t seem to know the words too well. But a great performance. And the song is just so much fun, done so well and such a glorious reminder of Springsteen’s life on the boardwalk. 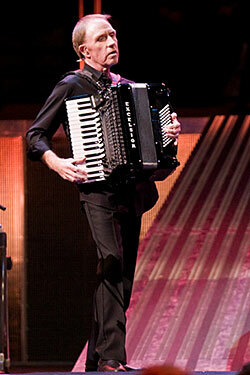 I must mention that Danny starred on this one, stepping out from behind the organ for some beautiful accordion playing. In many ways, this was Danny’s night. 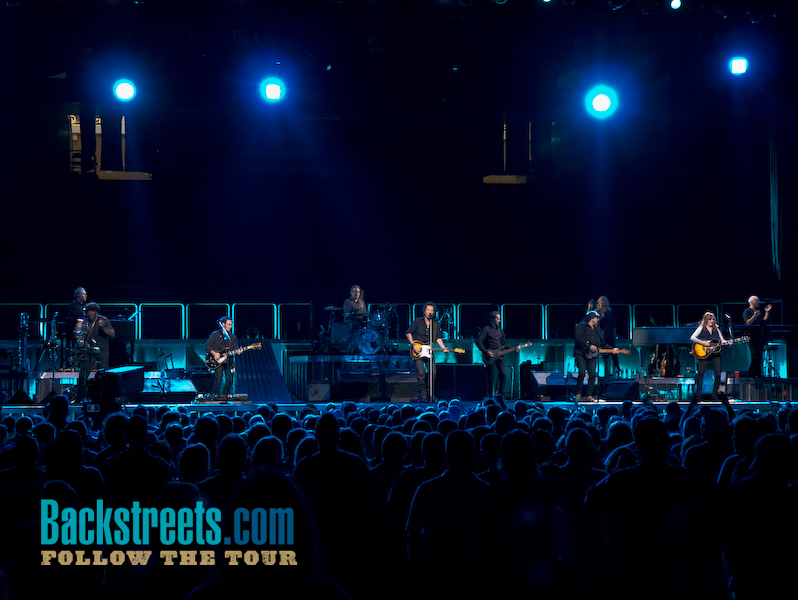 The E Street Shuffle: and you have to go waaaayyyyy back to hear that one live. Sad for a Bruce tramp like myself to admit but not one I know well. But it sounded incredible. Working on the Highway followed, a fun song from BITUSA that is just a great “sing-along” song when performed live. Always a good one. 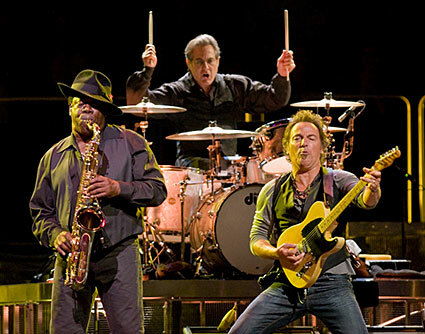 One thought I had here — I saw many people snapping pictures with their camera phone and I know how crappy the quality is — why can’t the tour management arrange to have a few professional digital images of the band on stage (and of Springsteen) at each show. You know how you take a boat ride (or on some amusement park rides) and they have pictures you can buy as you exit? Same concept — Have a few high quality digital images available and sell them after the show. Now THAT’s a souvenir worth having! Devil’s Arcade: Probably my favorite song on the new album. Arcade is even better live. The song is hypnotic, sung with real passion, and just draws you in. I liked the effect of Springsteen superimposed over Max’s drums for “The beat of your heart, the beat of your heart.” Gorgeous. And in my opinion, the most personal, poignant song about war — any war. The ambiguity about the two characters — is the soldier dead? Is he recovering? Will he recover? You can just FEEL how many times that’s happened in real life — the lover talking to her wounded / dying soldier at the army hospital — “Promise me tomorrow. Promise me a future.” Or “I promise you a future. It will be better, this will fade away.” No matter what the interpretation, this is one of my favorite Springsteen songs ever and he performed it with searing passion. The Rising: Another great tune from the album of the same name; dependable and always gets the crowd going. Everyone’s on their feet again. Last to Die: No speeches in front of this one, it isn’t needed. If you don’t get the message on this song, well, you ain’t been listening. Springsteen belts this one out hard and it works. Long Walk Home was a full-blown arrangement rather than the laid-back style from the CD. Liked it a lot. Badlands: What can you say? Everybody knows it, everybody loves it, the house lights are up, my new best friend is high-fiving me again and we’re just screaming it out. The main set was over and the crowd wanted more. You know the times are changing when the practice of holding up cigarette lighters has been replaced with cell phones. Glad people are smoking less, but man, there is NOTHING like being in a concert where the fans are demanding more by creating a galaxy of stars with upheld cigarette lighter flames. Springsteen returned to talk about the Greater Boston Food Bank — he’s been endorsing local food banks since at least 1984 by my memory (probably much earlier) — and commended their good work to prevent people to have to choose between food and heat. He then dedicated the next song to the Massachusetts girls and broke into Girls in Their Summer Clothes which was another fun song and I think destined to become a concert staple. Kitty’s Back: Okay, okay, another one to file under, “Sad for a Bruce tramp like myself to admit but not one I know well.” I promise to listen to “Greetings” and “Wild and Innocent” more. The song has a long instrumental intro and ending and the music was great. It’s a song with jazz, blues, and it’s, well, sultry. The song feels hot and captures the spirit of Springsteen in the 70s. 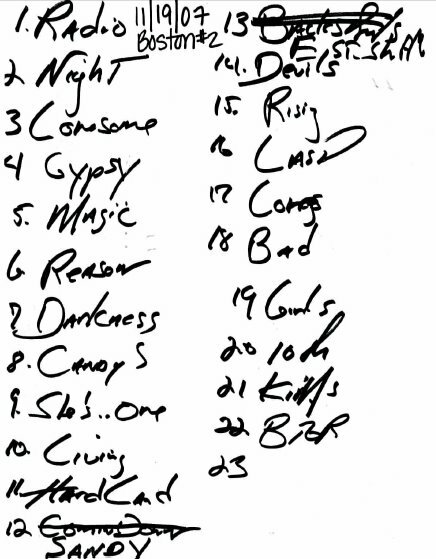 And it felt like the band was improvising a lot during a lengthy (9 minute or so) jam session. Great stuff. Awesome. Born to Run: BTR full-blown is a staple of most Springsteen shows and I know I’m gonna get flogged for this, but maybe it’s time to retire it for a little while? Sort of like Rosalita, it’s so expected at a Springsteen show that even the raise-the-roof blockbuster performance I saw was — well, I’ve seen it before. Many times. In its place, I would’ve loved another lesser played song, like Backstreets, or Meeting Across the River. Or Dream Baby Dream. Maybe next time? tually scroll on the screen!) and when you first hear it you wonder if the band is playing Celtic folk music or something. The song would’ve been perfect for the Seeger sessions tour, as the Springsteen-penned song talks about the rainbow of immigrants who came to the supposed gold and diamond lined streets of America for a better life. I’m sure it’s no coincidence that the song is identifiably Irish/Celtic, a nod to all the Irish immigrants of a century ago. But every immigrant is represented; the song talks about all the races and creeds that came here to make their home in this American Land. They made the steel, built the bridges and the roads and the buildings, and now are being kept out. It’s another credit to my idol that he can take such important and poignant lyrics, comment so well on contemporary issues, but set the song to a beat that you get up and dance to. It really is a fun song, and the displayed lyrics add to the “sing along with Bruce” mood as the show ends. In every Springsteen show I’ve ever been to (and this is my 17th since 1985) Springsteen introduces the band around the middle of the show — but tonight, it was at this end point that he did so. Rather than give a little bio of each member or the instrument (for example, “on the drums, star of late night “telly-vision,” the Mighty Max Weinberg,” he just called out their name, and I could see the reasoning — this was a show for the fans, and we weren’t being introduced to their band members — we were being given a chance to applaud our old friends. A high-octane, 2:15 show with barely room for breath as Springsteen belted out 24 incredible songs. He’s off to Europe next week and will be back next March — here’s hoping I can score tickets to another night of “Magic.” Thanks for an amazing birthday present, Bruce!